When You're Not "Hispanic Enough" for Others: Ted Cruz is Attacked by Democratic Party Chair — The Life and Times of a Young Professional in San Antonio. Growing up in the Rio Grande Valley, I never felt like much of a minority. Everyone around me was Hispanic, but that didn't necessarily meant that I fit in. I have always felt some sort of struggle with my cultural identity because of the color of my skin, the way I pronounce my name and the choices in life I make for myself. Starting with the first: the color of my skin. I have pretty light skin and many people tend to forget that just because you are Hispanic doesn't mean you are automatically of a darker skin tone than everyone else. Am I not Hispanic enough because I'm not "brown" enough? How about the way I pronounce my name? There's the Spanish pronunciation with accents and all and then there's the way I elected to say my name, really a personal preference, later because it made it easier for college professors and friends up north to say my name without it sounding foreign to me. Finally, I'm a proud conservative and it seems like you can't be conservative and Hispanic or you're labeled "not Hispanic enough" or a "race traitor" by others. Sadly, now Democrats are tearing apart Ted Cruz for the same reasons I listed above. At the Republican National Convention in Tampa, party officials touted Texas Senate nominee Ted Cruz as one of its party’s Latino rising stars. The new chairman of the Texas Democratic Party, Gilberto Hinojosa, not only disagrees with the rising star part — he is not so sure of Cruz’s Hispanic heritage that has was touted in a prime-time speaking slot at the Republican National Convention. “This is a guy who didn’t claim that he was Hispanic any time before he won a primary,” said Hinojosa in an exclusive interview with WFAA-TV in Dallas. Hinojosa accused the Texas Republican Senate candidate of denying his Latino heritage by not using his given first name. “If I was named Rafael Cruz, I would be proud to use that name. This guy has denied his own Hispanic heritage, if he is a Hispanic,” Hinojosa said. “He is not?” the WFAA reporter interrupted. “I mean, you are what you believe you are,” Hinojosa responded. Racially charged sentiments that pit Hispanics against each other are disgraceful. We should be proud of the accomplishments our people have made. Do I agree with the views of Supreme Court Justice Sonia Sotomayor? Not a chance in hell. But am I proud that a Hispanic woman sits on the United States Supreme Court? It's something I probably never thought could happen, so you're damn right I am. 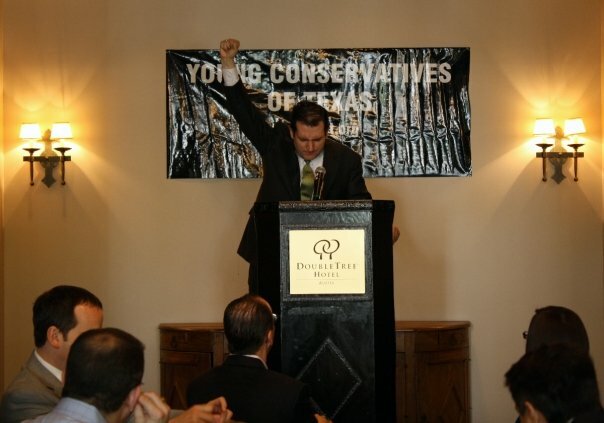 The first time I ever saw Ted Cruz speak was in early 2009, and his speech to the Young Conservatives of Texas was all about his heritage and how his deep rooted values stemmed from his Hispanic heritage. As one of the few Hispanics in the audience I was in awe of the powerful speech and the way he eloquently expressed the same challenges I faced as a young, Hispanic conservative. Because I am fair skinned and because I pronounce my name as "law-ra" instead of "lau-da (accent on the 2nd A)" doesn't make me less Hispanic. I wonder, when my last name changes after I get married how much "less Hispanic" I would be considered. These are the exact reasons I went through so many inner monologues trying to decide whether or not to change my last name. When I have kids will they be considered "not Hispanic enough" because they will be half Caucasian?? These aren't even thoughts a human being should have to think about! I thought we lived in a so-called post-racial society. Anyone who thinks racism suddenly vanished after the 2008 election obviously should use these comments by the Texas Democratic Party Chairman as a wake up call. I'm really saddened that remarks like this are still being made, especially by people who hold positions of power, in the year 2012. I thought racial biases had been put to rest. The Democratic Party Chair should step down for his offensive, racially charged comments. Now People Think Mayor Castro "isn't Hispanic enough"